PTB has much expertise in developing primary calibration for dynamic measurement of acceleration, force, pressure, torque and conditioning amplifiers. In addition, PTB is also one of the leading NMIs in the development of mathematical and statistical methods for the analysis of dynamic measurements. Further to this project, PTB has coordinated the EMRP IND09 DYNAMIC project and the EMRP NEW04 UNCERTAINTY project, led the algorithm development work package in EMRP ENG63 GridSens and the software development work package in EMPIR 14SIP08 DYNAMIC. CEM has much expertise in state of the art vibration and force metrology. CEM participated successfully in the EMRP IND09 project with the development of a primary standard for dynamic calibration for force sensors. IMBiH has significant experience in international projects and management of working groups. IMBiH brings to the project expertise on uncertainty evaluation, using statistical methods, such as Monte Carlo methods and Bayesian approaches, and its implementation in software. INRIM has significant expertise on state-of-the-art temperature and humidity standards, development of temperature and humidity calibration and measuring equipment, development and manufacturing of industrial sensors and sensors networks and their calibration methods, uncertainty analysis in dynamic temperature and humidity calibration and testing. INRIM will contribute to the development of temperature and humidity dynamic calibration techniques and, together with SPEA, to its industrial implementation in MEMS testing processes and the in-situ implementation of the developed toolboxes. IPQ has extensive experience in uncertainty evaluation in measurement, statistical modelling and data analysis and has links with mathematical (CCM/CIMA) and engineering (INESC-M) research centres in Portugal. IPQ has been involved in several successful European Research Projects, within the framework of EMRP and EMPIR, namely in the temperature domain. LNE’s department of ‘Mathematics and Statistics’ has developed a strong expertise in measurement uncertainty evaluation. The department is involved in the JCGM that maintains the GUM. Its main scientific activities cover methods for uncertainty evaluation, statistical inverse problems, and deconvolution methods in a probabilistic framework, implementation of ML tools for measurement applications or treatment of inter-laboratory studies. LNE has been involved in several successful European research projects such as EMRP IND09 and EMRP NEW04. NPL’s Data Science Group specialises in mathematical modelling, simulation of measuring systems, data analysis and uncertainty evaluation. The group takes a leading role in the JCGM that is responsible for publishing the GUM and the VIM. The group led work packages in EMRP projects NEW04 and IND09 and it currently co-ordinates the 14SIP08 project Dynamic. TUBITAK has experience in conducting R&D activity for metrology in addition to disseminating measurement standards. It is responsible for realising and maintaining national measurement reference standards, ensuring measurement traceability, conducting research in fundamental metrology and supporting the legal metrology system in Turkey. TUBITAK was a partner in EMRP IND09 where it developed a primary dynamic pressure calibration standard. VSL has ample experience in uncertainty calculation, statistical modelling and data analysis both for classical measurement tasks and for newer metrological areas. Past projects related to the FoF concept are the FP7 projects MEGaFiT and aim4np both dealing with calibration of inline measurement systems. Furthermore, VSL is involved in projects related to sensor validation of air quality sensors and is actively taking part in the development of a new standard regarding performance evaluation of such sensors in CEN/TC 264. SPEA brings in their long-term experience in designing and manufacturing test equipment for microchips and electronic boards. SPEA’s Test Cells series was the first complete test solution for MEMS in the world. Together with the metrology expertise of the NMI partners, SPEA’s experience in MEMS testing and manufacturing of the corresponding facilities will be the foundation for the intended work in MEMS temperature calibration. STRATH and its Advanced Forming Research Centre (AFRC) is one of 7 elite centres that form the UK High Value Manufacturing Catapult, which is the catalyst for the future growth, and success of manufacturing in the UK. AFRC has over £25 million worth of equipment, built to industry's specifications with 8 Laboratories and 2 Workshops to heat, shape, finish, measure, test and analyse a variety of metal parts and components. TU-IL has long experience in high precision measurement and dynamic measurement. It has been working in the area of force and weighing technology for many years. In addition to force and weight, the institute deals with the research areas of interferometer-based length measurement and temperature metrology. It’s Research Training Group “Tip- and laser-based 3D Nanofabrication” will provide expertise to the project. UCAM brings in the expertise of the Distributed Information and Automation Laboratory (DIAL) within the Institute for Manufacturing, Department of Engineering. It has long standing expertise on autonomous cyber-physical manufacturing systems, manufacturing analytics, and the Industrial IoT; capturing the entire manufacturing control loop from digital data acquisition and analysis to autonomous decision making. UCAM’s strengths include the development of AI based solutions for industrial applications. ZEMA has an excellent reputation in the robotics field, especially human machine interaction, Industry 4.0 and smart sensor systems. ZEMA is collaborating closely with a wide range of industrial and research partners, specifically the German Research Centre for Artificial Intelligence (DFKI). The ZEMA test-bed established in national collaborative project MoSeS-Pro was used to develop a fully automatic ML approach for Big Data applications in industry. ZEMA will also contribute to technology transfer of the project results via its training efforts Kompetenzzentrum Mittelstand 4.0 (Competence Centre I4.0 for SME), Robotix-Academy and others. ITRI brings in expertise in a vibration sensing based prognosis method. The method uses model-driven based artificial intelligence and has successfully developed the Prognosis Monitoring System, including the function of performance assessment and fault diagnosis, for rotational equipment. ITRI will use model-driven based artificial intelligence and ML methods to train the predictive maintenance model. ABB (ABBN: SIX Swiss Ex) is a technology leader in power grids, electrification products, industrial automation and robotics and motion, serving customers in utilities, industry and transport & infrastructure globally. Continuing a history of innovation spanning more than 130 years, ABB today is driving industrial digitalization with two clear value propositions: bringing electricity from any power plant to any plug and automating industries from natural resources to finished products. ABB operates in more than 100 countries with about 147,000 employees. HBM Test and Measurement (Hottinger Baldwin Messtechnik GmbH) is the technology and market leader and offers products and services for an extensive range of measurement applications in several high-tech industries. HBM’s product range covers reference transducers, precision measuring amplifiers and data acquisition systems as well as test and analysis software. Users worldwide rely on the perfectly matched components of the complete measurement chain that guarantees minimum measurement uncertainty of the results. In 1977, HBM was the first calibration laboratory in the German Calibration Service (DKD), with force was the first quantity to be accredited. Today HBM is accredited for pressure, torque and voltage relation (mV/V). HBM was also the first company in Germany to be certified to the ISO9001 quality standard back in 1986. HBM's environmental management system has been certified to ISO14001 since 1996. INESC Microsistemas e Nanotecnologias (INESC MN - www.inesc-mn.pt) is a private, non-profit R&D Institute belonging to the INESC group of Research Centers. Located in Lisbon, INESC MN built the first microelectronics cleanroom in Portugal in the early 1990’s with equipment for 6” wafers and an installed 1.2 µm CMOS backend technology. Since then, the Class 100/10 cleanroom has evolved its focus towards micro/nanofabrication of sensors (magnetic, optical, MEMS) and microfluidics for Lab on Chip technologies. INESC MN is closely associated with the Instituto Superior Técnico, the Engineering School of the University of Lisbon. INESC MN is dedicated to leading edge research and development in strategic technological areas of micro- and nanotechnologies and the application of these technologies to electronic, biological and biomedical devices. INESC-MN also offers transfer of technology to both Portuguese and international industries through collaborative research, contract research, prototyping and consulting. We develop systems to measure and balance real-time the energy produced and consumed in manufacturing. In collaboration with the Polytechnic of Turin and the University of Turin, we are developing an electrical Cyber Physical System (e-CPS) Open Source, as part of the HOME project (www.home-opensystem.org). With this approach, transfer technology from Academy to Business, we participate to MESAP Piedmont Mechatronics Innovation Cluster. Founded in 1994, SPEKTRA GmbH Dresden has over 20 years’ experience in the field of sensor calibration. As accredited service provider and manufacturer of high-precision primary and secondary sensor calibration solutions, SPEKTRA equips NMI’s and industry laboratories worldwide with market leading sensor stimulation and test systems. Based on this know-how, SPEKTRA also develops optimized digital test solutions for major MEMS sensor manufacturers and is actively contributing to the evolution of MEMS testing and metrology. The focus of TNO lies on seven themes: healthy living; industrial innovation; defence, safety and security; energy; transport and mobility; built environment; information society. Mechanical Engineering Faculty of University of Sarajevo (MEF) has more than 55 years of tradition in higher education and provision of technical support to local development. It is leading Bosnia and Herzegovina higher education and research institution in providing educational, training and technical support within its scope of work in engineering. MEF has highly qualified lecturers and researchers and it is independent and widely recognized as a reliable partner with other higher education, research institutions or businesses. 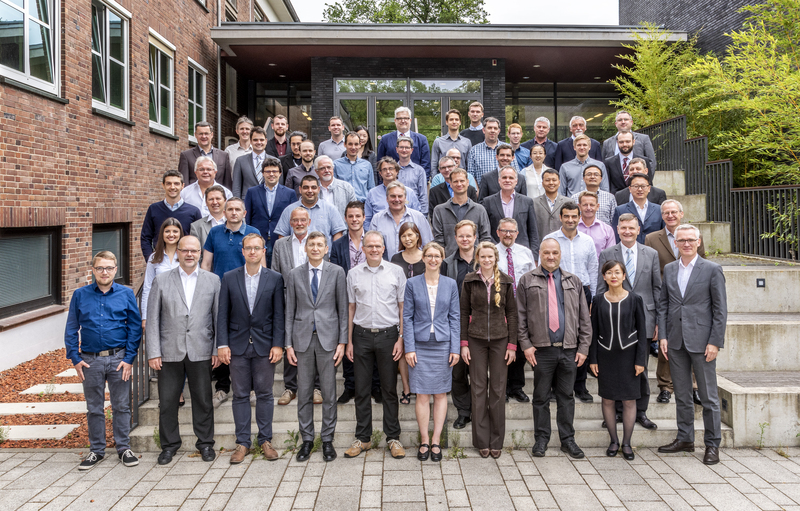 The GMA is a joint technical society of the VDI (Association of German Engineers) and the VDE (Association for Electrical, Electronic & Information Technologies), in which all joint activities of the two organizations in the field of measurement and automation control are concentrated. The work of the GMA makes a significant contribution to the further development of measurement and automatic control and to disseminating knowledge of the modern technologies applied in this field today. The GMA is a competent partner for users, manufacturers and scientists, for whom it coordinates knowledge transfer and cooperation. It contributes to allowing processes to be influenced in a targeted way and rapidly implemented into innovative developments for industrial practice.